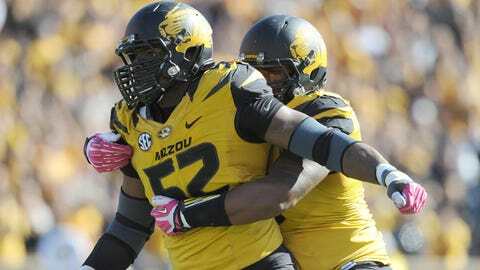 Tigers defensive lineman Michael Sam (52) led the SEC in sacks with 10 1/2 and tackles for loss with 18. ST. LOUIS — Who is Michael Sam? For much of his senior season, the Missouri football team’s standout fifth-year defensive end remained a mystery to those outside the walls of the Tigers’ locker room. Sure, we saw him every Saturday, chasing down whatever quarterback wearily wandered into his vicinity. We saw his signature sack dance, the rhythmic clap, clap, step and punch that also punctuated his graduation day. We heard stories from his teammates and coaches. But for much of the last few months, everyone except Michael Sam was talking about Michael Sam, as the defensive end eluded interview requests from the media as easily as he slipped past offensive tackles. But it left everyone wondering who he really is. Until last week. That’s when Sam finally broke his media silence and answered a variety of questions from the assembled media following a practice at the team’s indoor practice facility. What followed was a brief glimpse into the personality of the player who arrived at Mizzou as an unheralded two-star recruit from the tiny town of Hitchcock in Texas near the Gulf of Mexico and graduated as the second unanimous All-American selection in the program’s history. So … Who is Michael Sam? "Outgoing and never shy," he says. "If you think I’m a shy person, well, you’ve got another thing coming." Sam proved that during his session with the media. He praised his coaches, including head coach Gary Pinkel, defensive coordinator Dave Steckel and defensive line coach Craig Kuligowski, and he thanked his teammates, both past and present, for helping him along the way. "Aldon Smith and Jacquies Smith, I was behind two of those guys freshman and sophomore years," Sam says. "I learned from those guys. I was like, if Aldon can do it, if I can learn from the best, maybe I can be there one day too." Sam also talked about the motivation that led to his breakout senior season. "Coach Pinkel came in in the beginning of the year, in January, and just said we had to do something to earn some respect," Sam says. "I used that as motivation. I didn’t want to not go to a bowl game. I didn’t want (people to say), oh, we don’t belong in the SEC. So I used that as motivation." Sam says he was going to do whatever it took to help the Tigers win, a simple approach that paid off in a big way. He racked up 10.5 sacks and 18 tackles for loss to help Mizzou go 11-2, win the Southeastern Conference’s East Division championship and earn an invitation to the Cotton Bowl. "The goal was to win," Sam says. "Whatever I can do to help my team win I was going to do." The awards came rolling in for the 6-foot-2, 255-pounder. He was a first-team All-SEC selection, the Associated Press SEC Defensive Player of the Year, a first-team All-America from the Walter Camp Football Foundation, Sporting News, Associated Press, America Football Coaches Association (AFCA) and the Football Writers Association of America (FWAA) and a finalist for the Nagurski, Lombardi and Hendricks Awards. Pinkel says it’s difficult to earn All-American honors. "You think of all the great defensive linemen we’ve had around here, too," Pinkel says. "You would think we’d have more up on the wall. He’s very worthy of it. It’s historic. I think it’s the 33rd time in the history of the University of Missouri. You think of all the football players who have gone through here in the last 100 years. It’s hard to do." Sam enjoyed his time on the awards circuit. "Those rich people got their money’s worth because I’ve never signed so many autographs or took so many pictures or talked to so many people in my life," he says. But the Mizzou defensive end wanted to make sure his teammates also received credit for his success on the field this fall. He knows that guys like Kony Ealy, Markus Golden, Shane Ray, Brayden Burnett, Matt Hoch, Lucas Vincent and Harold Brantley, among others, also played a role. "Our defensive line is probably the best defensive line in the country," he says. "… I wouldn’t be here without them. They should get more credit than I get." The defensive line, which combined for 36 of Mizzou’s 38 sacks, pushed each other all season, in workouts, practice and on Saturdays. The line lost a first-round pick in Sheldon Richardson yet was significantly better in 2013 than it was in 2012. The unit’s competitiveness benefitted all of them collectively and individually. "(Sam’s) been great and it’s been a huge impact on our defense and also the players around him," Pinkel said. So who is Michael Sam? Well, he’s the "outgoing" and "never shy" person he says he is. But he’s also a guy who will leave a legacy in Columbia. You can follow Nate Latsch on Twitter (@natelatsch) or email him at natelatsch@gmail.com.